Jack Hazard (Norris) is a Cop On The Edge who is sent down to San Carlos (actually Puerto Vallarta, Mexico), presumably because his name is too awesome for the LAPD. All Hazard wants to do is just relax and be shirtless for a while, but he runs into the nerdy Steiner (Moskow) who has, as seems to be very common in this time period, a computer disc. What’s on the disc you ask? All the dirt on an unscrupulous, evil land developer named Lloyd Wheeler (Nouri), of course. Naturally, Wheeler sends Hazard and Steiner into the “Jungle of the Shadow People” so he can hunt them down and kill them. But Hazard has a few tricks up his sleeve for Wheeler and his gang of baddies. Aaron Norris...yes...AARON Norris here makes his bid along with relatives Chuck and Mike to be another action hero. And just in time too, as I was starting to worry that the world was running short on Norrises. He’s an odd-looking man, a sort of cross between David Heavener and Don Swayze. He’s the perfect star for those who find the work of Lorenzo Lamas too intellectually challenging. His line readings are beyond wooden, they’re petrified, much like the trees of the jungle the movie takes place in. He’s yet another goofy meathead, perfect for this movie however, which is yet another “Most Dangerous Game” retread. By 1996 they really should have known better. Perhaps that was the prevailing feeling on the set of Overkill, (which doesn’t really live up to its name by the way, nor does the promise of the name “Jack Hazard” get fulfilled), as Michael Nouri was probably only involved so he could go to a warm, sunny location, sleepwalk through a one-dimensional role and get a nice check. You can’t really blame him, but Aaron has even less energy than Chuck Norris, he doesn’t talk much, and when he does, his performance can best be described as shirtless and mulleted. So he’s not bringing the energy level up too high. Of course, there are the classic cliches and silly lines as well. This was director Ferrandini’s only directorial effort to date, and he’s much more well known as a stuntman, having a long and rich career in that field. He’s done stuntwork for Comeuppance classics such as Breakin’ (1984), Zero Tolerance (1994), Hologram Man (1995), and Invasion USA (1985), among other Chuck vehicles. With time, his directorial abilities may have improved, but I guess we’ll never know. Much of the movie is too dark to see, and needed more light. The plot is something we’ve all seen before and the audience must try way too hard to get invested, and at a certain point it’s just a lost cause. The movie needed some pep. Interestingly, the plot is similar to another Norris vehicle, Mike’s Death Ring (1992). By 1996, the music for these movies was just not as good as it used to be, and the movie has no memorable song. There is a song, “Paradise”, by the perplexingly-named “Food for Feet”, but come on. The days of Steve Butler and “Always on my Mind” were clearly long gone by now. Overkill is stupid and has an unbelievably lame ending. 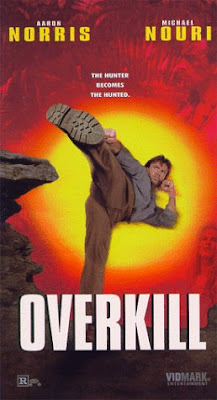 Our standards for movies like this are very low, but Overkill still did not meet those already rock-bottom standards. Overkill is “Hazard”ous to your health. I actually thought this film was OK, sure Aaron's not much of an actor, but the action scenes were pretty well-done. Otherwise this film is basically a weaker version of Death Ring. So many Norrises, so little time. I may have to steal your "so wooden its petrified" line because I'm running out of wood comparisons over here. I'll trade you "more wooden than a cigar store Indian". Venom: Agree about the ripoff of Death Ring. This could have been better. Nouri was underutilized as the villain. Michael Van Zant: Sure, you can steal the line! We will have to use yours soon. I like how it starts as "... is a cop on the edge." Don't they all? Haha, so true! most of these DTV action flicks are about cops on the edge. "For those who find the work of Lorenzo Lamas too Intellectually challenging..." That was fantastic. Great stuff man. Thanks a lot. Thanks for nice words.